When installing a stove, the proximity of combustible materials is a perennial problem. Normally a clearance of 3 x the diameter is required from combustible material to a flue pipe. 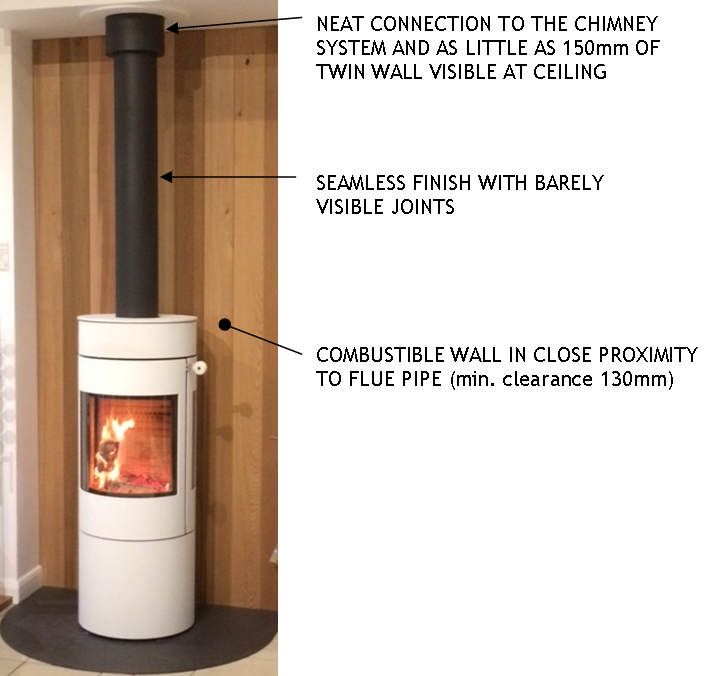 So, for instance, a 150mm single wall flue pipe will need a clearance to timber wall cladding of 450mm (18”) . To overcome this, the installer would normally resort to connecting an insulated twin wall chimney system directly to the outlet of the stove. This has several disadvantages from a technical point of view but is an absolute disaster from an aesthetic standpoint as standard chimney systems tend to be quite industrial in appearance and the larger diameter means that they are out of proportion with the stove. The elegantly designed stove is visually overwhelmed by the massive pipe. UED flue pipe is the solution. It is twin walled with a 7mm air gap between the inner and outer skin. This insulating air gap means that UED flue can be safely positioned as close as 130mm to combustible materials such as decorative timber beams. So, provided that the very minimal clearance of 130mm can be maintained, UED can be connected to the stove in place of the massive and cumbersome twin wall. The next great advantage of UED is when it comes to the ceiling above the stove. UK regulations require that at least 425mm of the insulated twin wall chimney projects below the ceiling before the connection to the flue pipe. As we have already mentioned, the chimney system is a much larger diameter pipe so the stepped effect so far from the ceiling is not a pretty sight. However, the unique properties of UED come to the rescue. With UED, the transition from flue to chimney may be as close as 150mm to the ceiling. Furthermore, if the UED pipe is teamed with the AT chimney system, a very neat finish can be obtained at the ceiling thanks to a very inconspicuous and smooth telescopic adaptor (ATALR). UED FLUE FROM THE BARN PROVIDES A WELCOME ALTERNATIVE TO THIS…….